How often did you look this summer on a map? You no doubt checked an interactive map for the weather forecasts, and you might have used an app to guide you on the roads you took during your vacation. In this post I would like to look at interactive online maps, more specifically HISGIS systems, historical-geographical maps, which have a clear connection with legal history. The choice of maps is rather great, and I am sure you will pick those closest to your own interests and curiosity. Several overviews have helped me to bring together the maps I mention here, first of all the overview at Anterosis, a project of John Levin. The Historical GIS Research Network, is one of the oldest websites with an overview of HISGIS projects. Lately I noticed the Electronical Cultural Atlas Initiative (ECAI), but the best current international overview of HISGIS websites has been created by the HGIS Lab, University of Saskatchewan. I dealt with a number of Dutch and Belgian projects in an earlier post concerning the bicentenary of the Dutch Cadastral Service, and thus I thought I could hardly bring you my typical Dutch slant. However, last week I noticed a veritable portal with a number of interactive maps concerning Dutch culture and history which seems perfectly fit for inclusion here. Let’s start the tour with the United Kingdom to honor the work of the team of the Historical GIS Research Network. I could mention a lot of projects concerning London, but Locating London’s Past can stand as a fine representative of other projects. A more general map project deals with Ordnance Survey Maps (National Library of Scotland, Edinburgh). Tithes are the subject of a project of the West Yorkshire Archives Service, Tracks in Time: The Leeds Tithe Map Project. Another project with tithes, Cynefin Project: Welsh Tithe Maps, brings us to the National Library of Wales in Aberystwyth. The project City Witness: Medieval Swansea contains some materials which I found particularly fascinating. Maps are only one aspect of this project with as one of its cores the story of nine men around 1300 about the hanging and miraculous survival of William Cragh. Among the textual witnesses used at City Witness is the manuscript Città del Vaticano, Biblioteca Apostolica Vaticana, ms. Vat. lat. 4015, for which you can access online in DigiVatLib a digitzed version of a black-and-white microfilm. For Ireland one has to single out the project The Down Survey of Ireland: Mapping a change (Trinity College Library, Dublin) with information about this very early land survey made between 1656 and 1658, and also Ordnance Survey maps and three historical GIS maps. Surely HISGIS projects are not confined to the United Kingdom or Europe. The best example to show this is perhaps The Digital Gazetteer of the Song Dynasty (University of California, Merced). A book about the rulers and administration of this Chinese dynasty (960-1276) was the starting point for Ruth Mostern and Elijah Meeks to create a much larger project to visualize the locations and extent of the power exercised by this dynasty. Ruth Mostern’s 2011 book provided the spur to start building this HISGIS. It did cross my mind to look for projects dealing with Classical Antiquity, but I had a firm impression that interactive maps and the use of digital tools are far more common among classicists than among legal historians. The choice of online projects as shown at The Digital Classicist Wiki is stunning. I do not know where to start best with the plethora of projects. Elsewhere I came luckily across a pilot version of a modern representation of the Tabula Peutingerana created by Jean-Baptiste Piggin not yet mentioned in this wiki. Piggin tries to use his knowledge about diagrams to go beyond the Peutinger map website by Richard Talbert. You might want to follow the relevant posts about his project at Piggin’s blog. For an idea of what has been done for HISGIS and Classical Antiquity you can get a distinct idea at the Ancient World Mapping Center (University of North Carolina, Chapel Hill) and the Antiquity À la Carte application. It is possible to commission new features to be added to this set of interactive maps. I propose to turn now to North America. Among the sites I would like to signal here are first of all projects with the closest affinity to normal maps. The Atlas of Historical County Boundaries (Newberry Library, Chicago) should in my opinion be viewed in tandem with Lincoln Mullen’s project Historical Boundaries of the United States, 1783-1912. Quite different are projects such as Jack Dougherty’s On the Line: How Schooling, Housing, and Civil Rights Shaped Hartford and its Suburbs, and Redlining Richmond, a project around the House Owners’ Loan Corporation and the New Deal in this town. Social and economic history comes into view at IWW History Project: Industrial Workers of the World 1905-1935 (University of Washington). I could not resist adding here a digital collecion without HISGIS maps, but I am sure the Sanborn Fire Insurance Maps digitized at the Library of Congress is a wonderful resource for American history. Inevitably some projects seems less easy to fit under one heading with similar projects. Close to geography are projects such as LandMark: Global Platform of Indigenous and Community Lands and Danske Herregaarde (Danish manors) of the Dansk Center for Herregårdsforskning. The Colonial Despatches: The Colonial Despatches of Vancouver Island and British Columbia 1846-1871 (University of Victoria) is based on the actions of the colonial government in these Canadian regions. One theme is clearly seen as most suitable for the use of HISGIS systems. It is striking how many sites for the study of the history of slavery use it to present sources or the results of research. Instead of going straight for matters connected in the first place with the United States of America or the United Kingdom it can be instructive to start elsewhere. The HGIS de la Indias (Universität Graz) is a portal with a Spanish interface presenting interactive maps for the period 1701-1808. The Caribbean is the setting of Slave Revolts in Jamaica, 1760/1761. A Cartographic Narrative. Transatlantic Slave Trade is one of the most studied elements in the history of slavery. MCC Slave Voyage The Unity 1761-1763 is a website of the Zeeuws Archief, Middelburg about one particular ship of a Dutch slave trading company. At Mapping Slavery NL you can trace Dutch slave owners in several towns. There are books and websites for city walks along traces of slavery, for example in Amsterdam and Utrecht, but I could not readily find these links at Mapping Slavery NL. For the United States we meet again Lincoln Mullen, this time for his project Mapping the Spread of American Slavery. The Texas Slavery Project focuses on a single state. For a long time it belonged to the so-called Territories, the states joining the United States at a later point in time. Visualizing Emancipation (University of Richmond) is concerned with a later phase. The aftermath and long repercussions of slavery are a stake at Collective Violence: Mapping Mob Violence, Riots and Pogroms against African American Communities, 1824 to 1974. The United Kingdom comes into view with Legacies of British Slave-Ownership (University College, London). The University of Edinburgh has created the portal Cartographie des Mémoires de l’Esclavage. Looking at this overview I am sure I have probably missed a number of projects, but it is my objective to make the visual impact of maps for literally mapping slavery and other subjects more clear. When you read descriptions as the topography of terror we are inclined to think only of the Second World War, but creating maps of other events and phenomena is every bit as helpful and important. The last website I want to introduce here is a portal created by the Rijksdienst voor het Cultureel Erfgoed (RCE, Dutch National Cultural Heritage Service) in Amersfoort. The new WebGIS: Themakaart Portaal offers 22 different maps and atlases covering Dutch cultural heritage. As for now the riches of this portal can only be viewed in Dutch, and I cannot imagine why a version in English has not yet been created or at least announced for the near future. The landscape maps are also accessible at Landschap in Nederland, and the archaeological maps can be found also at a sister site, Archeologie in Nederland. A possible starting point is the Kaart van de verstedelijking (Map of urbanization) where you can among other things view Dutch urbanization between 1200 and 2010 and look at city plans taken from the major cartographical project executed by Jacob van Deventer during the second half of the sixteenth century. It is a pity that this cartographical portal does not contain all supporting information present at the landscape and archaeology portals. You can benefit from information about Van Deventer’s maps and the growth of 35 cities. On the other hand, can you really expect to find everything at a single portal? At least one of the maps has very substantial connections with legal history, the map concerning the medieval and later development of fen regions (Agrarische veenontginningen). Newly developed regions often came under a specific jurisdiction. In the north west of the province Utrecht a region is known for a peculiar tax, the dertiende penning (thirteenth penny) which had to be paid until recently at the sale of landed property. 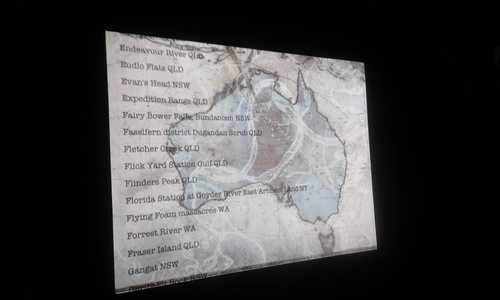 These jurisdictions have yet to be added to this RCE map. While looking at the map concerning flooding risks and cultural heritage I realize how much good maps are needed in regions of India, Nepal and Bangladesh suffering flooding right now, in late August 2017. Creating road maps for Nepal is one of the challenges the Red Cross – for example Missing Maps, American Red Cross – brought to the attention of the world. Volunteers are invited to use recent satellite photographs to make reliable maps for those striving to help people. Historical GIS systems can be as interesting as their modern forerunners, and there is space for legal historians to add to them anything they judge to be important. This entry was posted in Landscapes and tagged Archaeology, Asia, Canada, Classical Antiquity, Digital humanities, Geography, Legal history, Maps, Netherlands, Slavery, Social history, United Kingdom, United States of America on August 24, 2017 by rechtsgeschiedenis. In my latest post I almost lamented the emphasis on European history on my legal history website. In order to make up for any deficiencies I decided to choose a subject outside Europe for my next post. Ironically I arrived at New Amsterdam 1647-1661 thanks to the European History Primary Sources portal. This portal brings succinct records for digitized source collections of whatever nature, tagged with basic information about countries, languages, periods, subjects and resource type. The subject colonial provided an entrance at the EHPS portal for this digital collection created by the New York City Department of Records and Administration. The contents of this digital collection are mainly original and translated ordinances and regulations, a theme firmly within the scope of my blog. In fact the very preponderance of legal resources made me very curious about this collection. Other ordinances from Dutch colonies during the Early Modern period are now also available online elsewhere. Here I will look briefly at those digital collections, too. Earlier this year I enjoyed reading Russell Shorto’s book Amsterdam. A history of the world’s most liberal city (2013) about the rich history of the Dutch capital. In a conversation someone pointed me to his book about the early history of New York The island at the center of the world (2004) which I still had not read. In his book about Amsterdam Shorto dedicated a chapter about the impact of Amsterdam on New York (“Seeds of influence”), yet another reason to get hold of his study about the colorful history of the Dutch colony on American soil. At the moment of writing the digital gallery consists of just fifteen images and the series of municipal bylaws created between 1647 and 1661. The Municipal Archives and the Municipal Library of New York City will soon add more digitized items to this gallery. The heart of the digital collection is made up of ordinances and regulations. As for now there are four distinct series, the first with original Dutch records between 1647 and 1661, the second for a manuscript with translations of Dutch records (1647-1654), the third with a digitized version of a manuscript by E.B. O’Callaghan from 1868 with ordinances of New Amsterdam (1647-1661), and the fourth a digital version of the first volume of Berthold Fernow’s Records of New Amsterdam (7 volumes, New York, 1897-1898). The first section gives you an immediate experience of the surviving resources from the Dutch period of New York. Dutch historians will recognize a smooth seventeenth-century hand, and for others this kind of handwriting is vastly different from English handwriting of the same period. The manuscript with translations of the register shown in the first section might be the work of Cornelius van Westbrook or Edmund Bailey O’Callaghan. The third section gives a manuscript by O’Callaghan with his translation of the same register. In the last section Fernow took over O’Callaghan’s translation of the first register. The digital version shows only the translation of the same register (up to page 49). The register has been used to create a portrait of Stuyvesant, busy regulating daily life, in particular formulating policies ensuring the common good and adjusting affairs. The general impression is that of working out policies instead of working to ensure justice. Nevertheless I saw also an undated prayer for opening council meetings. If you would look in more detail you would for instance notice the ruling urging to pay Indians correctly for their work (September 28, 1648) and the order on the conveyance of real estate in courts convened by the Director-General (February 7, 1650). This raises the general question of ordinances concerning private law, other laws, the borders of jurisdiction and the functioning of courts. The first register is given an honoured place, but somehow I had expected more. It is nice to see the different stages from transcripts to translation, and it shows Charles Gehring and all working in his trail were not the first to deal with the records of the Dutch colonial period of New York and surrounding settlements and areas. Those dealing with Dutch palaeography would certainly welcome here a transcription of at least a part of this hallowed register. Let’s say it without hesitation, this digital gallery is really a showcase, if not for its content, then surely for using in its web address proudly the new domain .nyc, anyway shorter than the .amsterdam domain. Russell Shorto’s book appeared eleven years ago and it has become a classic work, even to the degree that its references remain unchanged in later impressions. For the latest scholarship about colonial New York and the New Netherland period you can turn to the only website Shorto refers to, the New Netherland Project, nowadays called the New Netherland Institute (NNI). This institute maintains a bibliography, and it has created an impressive digital library with both older publications and editions, and also digital versions of its own publications. In 2010 the New Netherland Research Center opened in the same building in Albany, NY, where the New York State Archives and the New York State Library are housed, too. The logical question to ask here is what we can find here concerning legal history. Property law is written large for example in the three volumes of the Register of the Provincial Secretary (1638-1660). Here, too, is the luxury of a digitized version of the first attempts at translation, Gehring’s modern translation and digitized images of the register itself. Three volumes have been edited with the Council Minutes for the period 1638-1656, a primary source for the executive, legislative, and judicial proceedings of the Director General and Council of New Netherland. The sixteenth volume in the publication series gives us Laws and Writs of Appeal (part I, 1647-1663). The second part of volume 16 contains translations of court minutes from Fort Orange (1652-1660). Again property law is the subject of the translated Land Papers (1630-1664). Fort Orange became eventually Albany. There are minutes of the court of Albany from 1668 to 1685, now kept at the Albany County Hall of Records. The list grows really long! The Van Rensselaer Manor comes into view, too, as are the New Netherland Papers of Hans Bontemantel, a director of the Amsterdam Chamber of the Dutch West Indies Company. Dutch colonial history elsewhere is also present, in the Curaçao Papers (1640-1665) (volume 17), here with a transcription, translation and images . With separate access to the introductions of all sets, a guide to weights and measures, and last but not least both the original guide to Dutch papers created by Charles Gehring in 1977 and 1978 and its digital successor (2011-2012), you can only wish to have an online directory to the older phases of Dutch palaeography to try to decipher some of the images and to look more closely at Dutch words in the transcriptions. Luckily the magnificent multivolume Woordenboek der Nederlandsche Taal has become available at Leiden in a fine searchable version. The link to the digital collections of the New York State Archives does at first only lead to a free text search and four browsing filters (collections, places, repositories, state agencies), but I could quickly spot the collection for the Dutch settlement at the Delaware river (just one document from 1656), the administrative correspondence for the Dutch colony in New York (231 documents) and colonial council minutes with for example the 1657 Flushing Remonstrance. Elsewhere, too, you can find digitized sources from the Dutch colonial period in the United States. At a branch of Ancestry is a useful links collection called New Netherland and Beyond. The section about the Dutch period (1621-1664) is the one to go for my purpose. You will find here for example A.J. Van Laer’s selections from the Van Rensselaer Bowier Manuscripts (1908) also dealt with by the NNI, and generally digitized versions of the finding aids, reports and translations created by Van Laer, O’Callaghan and Fernow. Interestingly Dutch ordinances from the Early Modern period are in particular available online for the Dutch colonial period. The Huygens Institute/Institute for Dutch history has created a digital version of the West-Indisch Plakaatboek within its project The Dutch in the Caribbean World c. 1670 – c. 1870. The digital Plakaatboek Guyana 1670-1816 has been launched in February 2015, and this project dealing with Essequibo, Berbice and Demerary, too, is accessible with an English interface. The Nederlandsch-Indisch Plakaatboek 1602-1811, Jacobus Anne van der Chijs (ed.) (17 vol., Batavia, 1885-1901) has been digitized partially at Oxford (vol. 1-3), but it is available completely – and nicely searchable, too – within the Colonial Collection of Leiden University Library. The version of Van der Chijs at Sejarah Nusantara, a portal for colonial history created by the Arsip Nasional Republik Indonesia, is even better searchable. For the Kaapse Plakkaatboek (6 vol., Cape Town, 1944-1951), edited by M.K. Jeffreys and S.D. Naudé, the first free volumes appear in the digital books section of the firm aiming to be the One and Only Web Firm. The two volumes of the Ceylonees plakkaatboek, Lodewijk Hovy (ed.) (Hilversum, 1991) deal with the period 1638-1796. In arrangement with the publishing firm you can view large parts of it online in the same virtual library as for its South African counterpart. Hovy added to his edition a book-length introduction. The Dutch presence in Brazil was an element in my post last year about Brazil’s legal history, but there is not yet a general edition of ordinances. By the way, in the Dutch language both spellings plakaatboek and plakkaatboek exist side by side, yet another difficulty to trace these modern editions and their older predecessors. By now it should be clear how necessary it is to view the digital gallery of one early register within a larger context, for example that of the Dutch colonial enterprises, but it is certainly wise to look also at other countries and their activities on the American continent. Even the English colonies show great differences. A monolithic view tailored to the taste of those wanting rapid answers caters for a substantial niche, but it does not bring you answers with subtle nuances or even new questions. Shorto makes a case for looking anew at both the origins of New York and the United States. Looking at the Dutch period and the legal transplants effected by the English can help to see American legal history in more depth, beyond the battlegrounds of originalism. Shorto tries to create a new picture of Peter Stuyvesant (around 1611-1672), yet it might seem he overstates his case. I cannot help thinking that one tries to make out much of relatively scarce resources. The translated documents show more pieces of a puzzle, and maybe indicate we have to deal with several puzzles with large gaps or with maps showing empty areas. In fact when preparing this post I did not just look at sources indicated at the website of the New Netherland Project. The Fordham University in Nw York City has created a digital collection of old maps showing New Amsterdam, New Netherland and New England. In Chicago the Newberry Library presents an interesting gallery with maps for American colonial history, initially made for educational use. A particular link with New Amsterdam is provided by the digital slavery collections of the New York Historical Society. Even if they do not deal directly with the Dutch period it is seducing to look at them in connection with the certification in 1665 by Peter Stuyvesant of land grants to manumitted slaves, digitized at the NNI. In 2016 the exhibit Origins – Light on New York’s founders will start. At the accompanying website the portraits of some iconic Dutch figures look already at you. Let’s hope this occasion will be just another spur to delve into the early sources of New York’s history and of American colonial history in general. It would be most welcome if at least some scholars and in particular legal historians study aspects of that early history starting with the original sources and reading the Dutch of the founders. Shorto makes you see the people, hear the many languages, smell the filth of the colony and the fresh air of a green island, and takes you on a voyage back in history much in the style of a novel. Exactly his fluent style and evocation of people and events make me shiver sometimes when I feel his imagination gets too strong. L.J. Wagenaar wrote in 1995 in his review of Hovy’s edition of Dutch ordinances for Ceylon these sources provided him with living images just like a novel. Russell Shorto cannot be faulted for using with verve a style that might be termed journalistic. His books make you curious for more. He raises questions and new views, and books with these qualities are as important as book with answers. He challenges us to write as lively as he can, to do the hard work in searching, studying and analysing resources, formulating new theories and creating vast vistas we would not have dreamt of before. Here I will honour Shorto by pointing in his way to a fact that might shed light on Stuyvesant. I am finishing this post at the Frisian island Terschelling, a familiar location for readers here. Near the village Midsland-Noord, a new part of the old village Midsland, is a spot with sands and heath called Stuyvesant, perhaps best translated as “moving sand”. Peter Stuyvesant came from a village in West-Frisia. Even without pursuing this toponym in full depth it hints at a certain quality of things eternally moving, partially hidden, partially blowing in your face, a presence which slip though your fingers like sand. My country can still boast a number of these moving sand regions as nowhere else in Europe. Just like New York Terschelling is blessed with a bay offering itself as a perfect natural harbor… There are limits to our knowledge, but they will move with every new question, with every new concept and view guiding our quest for perceiving the realities of the past. Legal sources might be tapped in ways yet untried, and historical sources can be read very differently when you put them side by side with the traces and sources of legal history. After finishing this post I felt slightly awkward about not mentioning any resources at the New York Public Library. For historical maps of early New York one can start with the online exhibition Mapping New York’s Shoreline, 1609-2009. 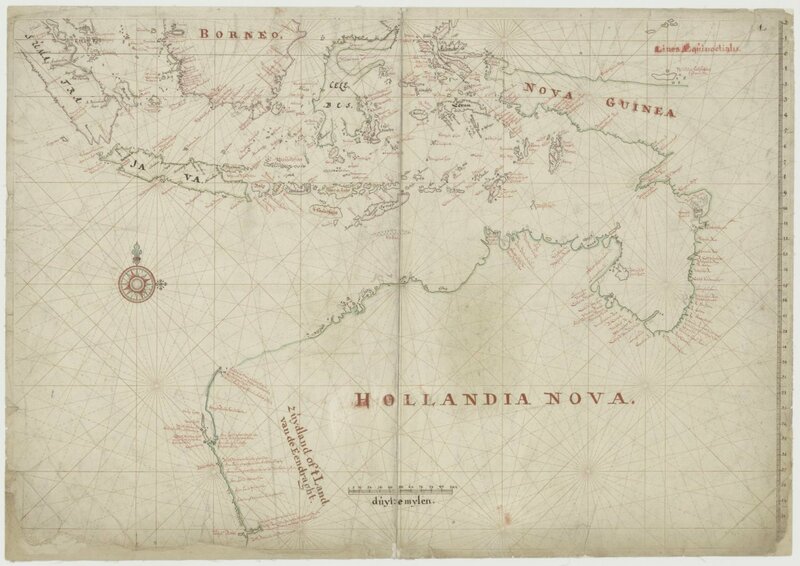 Among the digital collections of the NYPL are early maps. The research guide Sea Blazers and Early Scriveners: The First Guide Books to New York City introduces you not only to these early guide books, but gives you also quick access to relevant literature in the holdings of the NYPL. At my legal history website Rechtshistorie I have created a page with links to online guides and tutorials for palaeography. This entry was posted in Digital editions, Peoples and tagged Archives, Asia, Colonial history, Europe, Latin America, Maps, Netherlands, Slavery, United States of America on July 21, 2015 by rechtsgeschiedenis. This year’s International Archives Day, an initiative of the International Council on Archives, took place on June 9. In many countries archives organized activities, among them also Spanish archives. Lately I noticed the substantial number of websites devoted to the history of Aragon, and when preparing this post it became clear how many resources you can find online. On my blog I wrote in 2011 and 2012 about the project Europeana Regia which aimed at reconstructing three medieval royal libraries with digitized manuscripts. One of them was the library of the kings of Aragon and Naples. In his acclaimed study Vanished kingdoms: The history of half-forgotten Europe (London-New York 2011) Norman Davies devoted a chapter to Aragon. In fact he had to deal with two kingdoms, both the Reino d’Aragón (1035-1715) and the composite kingdom of the Corona d’Aragón (1162-1716), a confederation of monarchies including in Spain the county of Barcelona and the kingdom of Valencia, and outside Spain Sicily, Sardinia, Naples and Majorca, to mention only its largest parts. For clarity’s sake I use in this post the Castilian and Aragonese spellings of locations in a multilingual kingdom. The Catalan name of the Archivo de la Corona d’Aragón (ACA) in Barcelona is Arxiu de la Corona d’Aragó. You can view this website also in Galician, Basque and Valencian. Legal history is certainly present at the websites I mention in this tour of institutions digitizing Aragon’s history. In my earlier post concerning Europeana Regia I had tried to make a preliminary list of manuscripts touching on legal history. I found some thirty manuscripts among the more than thousand manuscripts brought together in this project. From the library of the kings of Aragon 294 digitized manuscripts are presented. In 2011 I had found for Aragon only one work touching legal history, a treatise on the genealogy of the Aragonese kings (Paulus Rossellus, Descendentia dominorum regum Sicilie, after 1438; Valencia, BU, ms. BH 394), but luckily there is more. In 2012 I tracked a well-known source in Paris, BnF, ms. Latin 4670 A, the Usatici et Constitutiones Cataloniae, a manuscript written at the turn of the fourteenth and fifteenth century, and I could also point to Paris, BnF, ms. Italien 408: Ordinacione fate per lo S.re Pere Terzo Re d’Aragona supra lo regimento de tuti li oficiali de la sua corte, a manuscript from the 15th century. On closer inspection, after the closure of the Europeana Regia project, more can be found. Paris, BnF, ms. Espagnol 63 is the Latin and Catalan version of these ordinances of Pedro III, the Ordinacions de Pere III d’Aragó. A Spanish version of royal ordinances of Pedro IV of Aragon can be found in Paris, BnF, ms. Espagnol 62. Yet another manuscript at Paris (BnF, ms. Italien 958; written around 1477) contains the text of Orso Orsini’s Del governo et exercitio de la militia. Correspondence of king Ferdinand I from 1458 to 1460 in Latin, Catalan and Italian has been preserved in the manuscript Paris, BnF, ms. Espagnol 103. A copy of Guillelmus Duranti’s Speculum iudiciale (Paris, BnF, ms. Latin 4254) was both owned by the French king Charles VIII and later by the kings of Aragon, but eventually it returned to Paris. 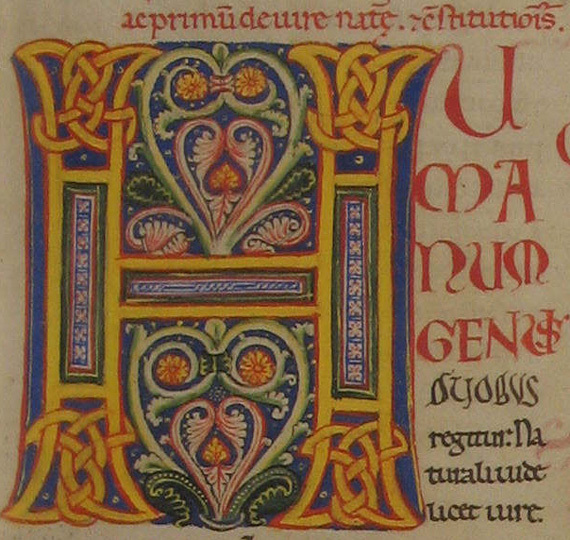 An illuminated and glossed Bolognese copy of Justinian’s Institutiones and the Authenticum at Paris (BnF, ms. Latin 4436) belonged once to the royal library in Naples. It is intriguing to note that only one of these nine manuscripts with legal texts is now at Valencia. Jonathan Jarrett (Oxford) gave in 2011 at his blog A Corner of Tenth Century Europe a nice description of the building of the Archivo de la Corona d’Aragón (ACA) in Barcelona and its workings. The ACA traces its history back to 1318 and offers its own virtual tour. Among the many Pedro’s in Spanish history Pedro el Gran (1240-1285) stands out. 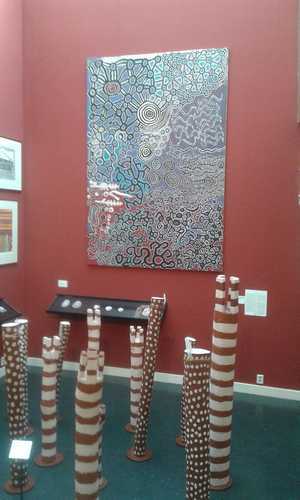 The ACA organized in 2012 an exhibition on this king; some information on it can be downloaded (PDF). The ACA shows several virtual exhibitions on its website, for example on its own history, historical maps, and especially on Los Libros de Repartimiento of king Jaime I on his possessions in Mallorca and Valencia. In the online exhibition of illuminated medieval manuscripts at the ACA figure a Liber feudorum major from around 1180, the oldest document kept at Barcelona (ACA, Real Cancilleria, registro 1), a Liber feudorum Ceritaniae (ACA, Real Cancilleria, registro 4), and a Decretum Gratiani (ACA, Manuscritos, Ripoll 78), actually one of the very few sources for the first version of Gratian’s Decretum. The progress of the project led by Anders Winroth at Yale University for the edition of this version can be followed online. Winroth described Ripoll 78 in his study The Making of Gratian’s Decretum (Cambridge, etc., 2000) without mentioning the illuminated initials. The ACA provides links to several databases with guides for archival research. At PARES, the Portal de Archivos Españoles, you can search for digitized archival records from Spanish archives. The ACA gives you at its website a brief list of items and records present at PARES. Ripoll 78 is among the digitized manuscripts at the ACA which you can view at PARES. Apart from archival records you will also find digitized manuscripts from the monasteries of Ripoll and San Cugat now kept at the ACA. At PARES you can find resources using the Inventario Dinámico by selecting the ACA and searching the tree-like representation of the various collections. With the more normal search function you can simply type your preferred term and get a result list. In the winter of 1991-1992 I participated at Leiden in the yearly seminar on juridical palaeography. We read some treatises contained in San Cugat 55, in particular at fol. 92 and 93. I suppose you will forgive me for choosing the 87 digitized medieval manuscripts from this monastery as an example of a result list with items at the ACA. Alas the images are disfigured by a watermark of the Archivos Estatales. On the legal manuscripts from both monasteries more information is available online in the Manuscripta Juridica database of the Max-Planck-Institut für europäische Rechtsgeschichte in Frankfurt am Main and in Giovanna Murano’s incipitario of medieval manuscripts with canon law texts. Due to the move to a new building the library of the institute at Frankfurt am Main is temporarily closed, and thus it is really useful to know that you do not have to wait for all of its microfilmed manuscripts if you want to study them. Among the digitized archival records are ninety registers of the Real Cancilleria from the thirteenth century – a project briefly described here -, registros of other kings, and several trial records (procesos). A large number of records from the Consejo de Aragón and the Real Audiencia have been digitized. It is difficult to choose examples from the digitized riches at the ACA. Surely I would single out in the section Diversos y Colecciones the nearly 200 cartes árabes and the 126 autógrafos of Spanish kings and queens. Trials in civil law, pleitos civiles, are being digitized from the Real Audiencia de Cataluña where some 22,000 trials survive. Archival records for the Gran Priorato de Cataluña del Orden de San Juan de Jerusalén the Knights Hospitaller of Saint John, have been digitized, too (ACA, ORM, Gran Priorato, Volúmenes y Legajos). One of the highlights at the ACA are the socalled Capitulaciones de Santa Fe, which bear also the name of Capitulaciones del Almirante don Cristóbal Colón, the agreement between Christopher Columbus and the Reyes Católicos, signed on April 17, 1492. Some of these documents are kept at the ACA (fondo Real Cancilleria, Diversorum, registro 3.569; PDF, 3,2 MB) and elsewhere in Spain. In 2009 the Capitulaciones were added to the UNESCO Memory of the World register. However, the UNESCO photo database shows just two images, and I therefore like to point also to information on an exhibition concerning the Capitulaciones provided by PARES. A particular motive to write about Aragon is the proliferation of digital libraries. Last week I encountered yet another digital library, at the Cortes de Aragón. On my website I listed already some twenty-five Spanish digital libraries! The Biblioteca Virtual de Derecho Aragonés is maintained by the Gobierno de Aragón. The Gobierno de Aragón at Zaragoza maintains also its own Biblioteca Virtual. I did know about the Biblioteca Valenciana Digital and the SOMNI, Fondo histórico of the Universidad de Valencia. The Biblioteca Municipal de Zaragoza has its own digital library, too. Some 1100 rare books have been digitized at the Biblioteca Virtual de la Diputación de Zaragoza. You will find manuscripts, incunables and other early editions among the Tesoros of the Biblioteca Universitaria de Zaragoza, a selection from its Biblioteca Digital del Fondo Antiguo. The ACA, too, thoughtfully provides a bibliography of the main publications concerning this archive, with links to digitized resources, some of them available at the Internet Archive. In the Fondo Documental Histórico of the Cortes de Aragon you can find digitized manuscripts, drawings, maps and books. Among the manuscripts is a fifteenth-century legal treatise, and you will find also manuscripts of the Coran. Fuentes, source editions for Aragonese law, are to be found in the section with printed materials. My interest was guided to the sixteen printed allegaciones, legal pleadings, and the nine volumes with ordinaciones. I found a Dutch twist, too: Blaeu and Hondius figure among the digitized maps. In 2012 a portal was created around the life and historical works concerning Aragon of the Jesuit Jerónimo Zurita (1512-1580) who became in 1547 the Cronista del Reino, the official historian of the kingdom of Aragón. The portal brings you not only to digitized editions of his books, foremost among them the Anales de la Corona de Aragón (1562-1580), but also to other chronicles, documents showing Zurita’s activities, and digitized studies on this scholar. Let’s not overload this post with too much digitized materials from Aragon! At PARES it is wise to look for the history of Aragon not just at the ACA, but also in Madrid and Simancas. The DARA website for the Documentos y Archivos de Aragón is one of the places to look for further guidance. In fact the PARES portal guides you also to the Censo-Guía de Archivos de España y Iberoamérica, an online guide to Spanish and Ibero-American archives. The Gobierno de Aragón gives an overview of Aragonese culture and heritage at the portal Patrimonio Cultural de Aragón. It is possible to mention here a number of archives, but I will restrict myself to the Archivo Histórico Provincial de Zaragoza, with in its holdings records of the Tribunal de la Inquisición de Zaragoza between 1440 and 1621. The ACA is an institution in Barcelona, within Catalonia. The Memòria de Catalunya portal brings you to many collections. One of these collections is specifically concerned with Aragon and contains some 1700 allegaciones, pleadings by barristers who were members of the Illustre Collegi d’Avocats de Barcelona. I could not help noticing the library of this college has also digitized its Atles Blaviana, the Atlas Major of Joan Blaeu (11 vol., Amsterdam 1662), accessible at the Memòria de Catalunya. A very interesting and detailed online bibliography on Aragonese law in past and present is offered at Standum est chartae, the website of the department for derecho civil aragones of the Universidad de Zaragoza. Of course other Spanish digital libraries offer online access to books and other documents concerning Aragon. It is in particular useful to look at the portal Legislación Histórica de España. The Biblioteca Digital Hispánica of the Biblioteca Nacional de España in Madrid yields many hundreds results after a simple general search for Aragon, among them nearly 200 manuscripts. At Hispana, the general portal for Spanish digitized heritage, it is not only possible to access digitized items, but you can benefit also from the indications found in the directory of digital collections. Similarly the Biblioteca Virtual del Patrimonio Bibliográfico helps you to search for materials in many Spanish libraries and archives. A number of Spanish archives, including the ACA, the Archivo General de Indias in Sevilla, and the general archives at Madrid and Simancas, have created a network for their library catalogues, the Catálogo Colectivo de la Red de Bibliotecas de los Archivos Estatales. At the end of this post I feel confident that you will find something useful here when you start to study Aragon and the many sides of its legal history. A number of websites mentioned here is also accessible in English. Digitization projects provide in a very real sense a royal road to many valuable resources concerning the kingdoms of Aragon. Scott Cave and Ashleigh Dean created the invaluable online guide Taming PARES which help you to navigate and use the tree structure of the digitized records at the PARES platform. This entry was posted in Manuscripts and tagged Aragon, Archives, Digital libraries, Legal history, Maps, Medieval canon law, Medieval law, Spain on June 21, 2013 by rechtsgeschiedenis.